Within these pages is a collections of essays written over the course of 2014. They were carried by a number of online publications: Cryptome, Pravda, the Sri Lanka Guardian, Dissident Voice, Scoop, CounterPunch, Intrepid Report and Windows to Russia. Obviously these publications are not mainstream media nor in the lofty class of new media like the Intercept or Buzzfeed. And that’s just fine as the audience-base for these websites is not only niche-American locales, but other geographic locations like Asia, Canada and South America. The pieces that appear in the CounterPunches of the world are generally written by all “submitters” for no compensation; that is, they take time out of their “pay days” to write about matters that make them toss and turn at night. Those sleepless nights revolve around trying to convince those who will read/listen that the powerful–taking form, as say, technologists, pundits and political leaders–are clearly leading humanity on a long doomsday path. The evidence is visible: In the USA and Europe by the not so subtle global covet/overt operations to overthrow “elected” governments like Ukraine and Egypt, with the long view to usher in regime change in Russia and China. The return to expanding nuclear weapons capability in the USA and Russia. The implementation of crushing Austerity programs even as, in the USA, infrastructure degrades. But maybe the negativity I and others express is equally misguided as humanity is now on the cusp of re-engineering itself through genetics and bio-engineering. The properly redesigned human could likely survive well in a world of scarcity, one ravaged by climate change and war. But what would the next-generation humans do with older models like us? 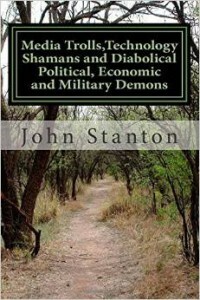 The title of this book refers to Trolls, Shamans and Demons. We listen uncritically to them all at our own collective peril. If we don’t listen we hideout in our favorite TV show, video game, chat room or fasten the head phones on to drown them out. We choose to hide from them and now each other. What’s to come?